Now we got the unofficial Lineage OS 16 ROM for OnePlus 6. You can Update OnePlus 6 to Android P via LineageOS 16. Lineage OS builds have finally released & you can Install Lineage OS 16 on OnePlus 6 (Enchilada). The developers have released the Android 9.0 Pie Lineage OS 16 for OnePlus 6 variant. The ROM is now available for all OnePlus 6 users and they can install it manually. Before flashing Lineage OS you have to flash Oxygen OS/Hydrogen OS Open Beta in TWRP twice. The Oreo firmware is not supported and you might face an error “There’s an internal problem with your device. Contact your manufacturer for details” on every boot. No worries on that! Soon they will fix it asap! You can download Lineage OS 16 for OnePlus 6 now which will be based on Android 9.0 Pie. And to Flash LineageOS ROM, you need Universal Bootloader and Modem packages. 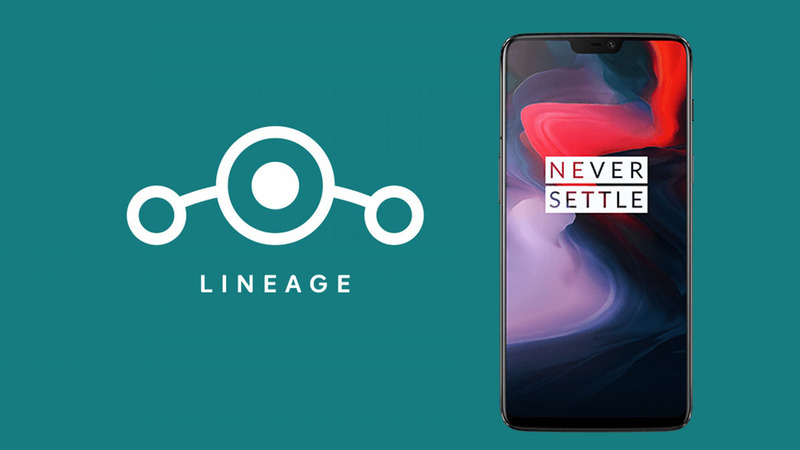 You can Download Lineage OS 16 for OnePlus 6 (codename: Enchilada) from the given link below. Also, download other required tools to flash the Lineage OS 16 ROM on your smartphone. Before you Install Lineage OS 16 on OnePlus 6, make sure you’ve unlocked the bootloader and rooted the device. And also you need to have ADB Commands installed on your computer which we use in this installation process. Let’s get started to Install Lineage OS 16 on OnePlus 6 Series. First, go to the Settings > About Phone. Tap on Build number for 7 times, until you receive the small message at the bottom saying you are already a developer. Now go back to settings home and you will find developer options. Click on developer option and then scroll down to OEM unlocking and then Enable OEM unlocking and USB debugging. Now connect your Mobile to the PC and go to ADB directory and issue the command ‘ADB reboot bootloader’ to boot your device into bootloader. Now in the command window type the following command ‘fastboot devices‘ This will display your device. Now use the following command ‘fastboot OEM unlock-go‘. This will unlock you devise Bootloader. After this reboot your device and go to Settings and developer options and again enable USB debugging. First, download the Lineage OS and Gapps from the above download section. Turn off your device and boot it into Recovery mode by pressing Volume up button and power button simultaneously. Now in TWRP, create a Nandroid backup and do Factory Resent. To do Factory Reset, go to Wipe > Advanced Wipe > Select Wipe cache, Dalvik cache, System, and data and Swipe to confirm it. Return to the Main menu and click on Install. Now you will be asked to select the file. Locate the ROM zip file & swipe to Install Lineage OS 16 on all OnePlus 6. In a similar manner install the Android Pie Gapps. Once done and before rebooting, select Wipe and wipe cache & Dalvik cache. Reboot your device & you will notice LineageOS boot animation. By performing the above method you can Install Lineage OS 16 on OnePlus 6 and you can have your hands on it. Hope everyone does ‘Install Android 9 Pie on OnePlus 6′ series. Do follow the steps carefully or else you can brick your device. If you have any questions while installing the Lineage OS 16 or facing any issues while trying to Install Lineage OS 16 on OnePlus 6, then do let us know in comments below.